NMM 10142. Snare drum by Lyon & Healy, Chicago, ca. 1893. Ornately inlaid rosewood shell utilizing seven different colors of wood. The large decoration features a natural horn, natural trumpet, and open musical score in the middle of a floral design which is inset on a darker section of wood. Ten leather tugs. Maple rims inlaid with a decorative pattern of interlocking lines in three colors of wood. 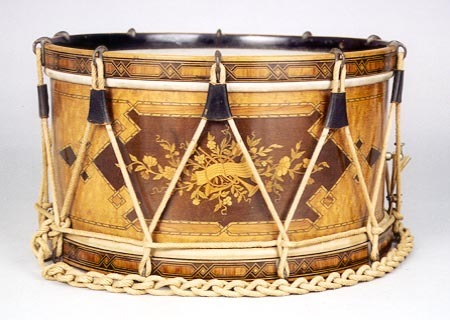 According to William F. Ludwig, this drum was exhibited at the 1893 Columbian Exposition in Chicago. William F. Ludwig II Collection, 2002.